Single source solutions are our specialty at AFP Transformers. 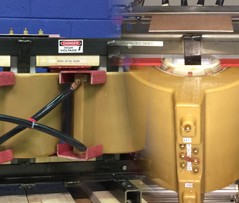 We have a wealth of experience in developing custom transformers and associated accessories for switchgear manufacturers, public utilities, and OEM customers. From concept development through production, we have the technical abilities, knowledge, and resources required to provide high quality, cost effective transformer solutions for any application. Capabilities include turnkey design and manufacturing, collaborative engineering, and application engineering. Our engineers can develop a design that meets the size, voltage, and performance needs of a given application in any production volume. Projects may start with a completed customer print, or a simple idea. All designs are verified in-house and optimized for cost and manufacturability. We have 2D and 3D modeling abilities to provide customers with complete schematics and drawings prior to production. All transformers are tested to applicable industry standards including IEC, IEEE, UL, and CSA specifications. Test parameters such as voltage, current, power factor, and efficiency are recorded and stored for analysis and verification. A variety of inventory management solutions such as Kanban bin systems and JIT shipping services are also available. These options give customers the ability to manage their supply chain according to their specific needs. For additional information about our single source transformer solutions, see the table below, or Contact Us directly.